I've decided to start a new, and hopefully monthly, series on this blog to set myself reading goals and to have a motivation to achieve them. It will be called To Be Read and (I guess it's quite obvious) it will feature books I want to read in the following month. I also want to feature quick reviews or thoughts on the books I read the previous month. 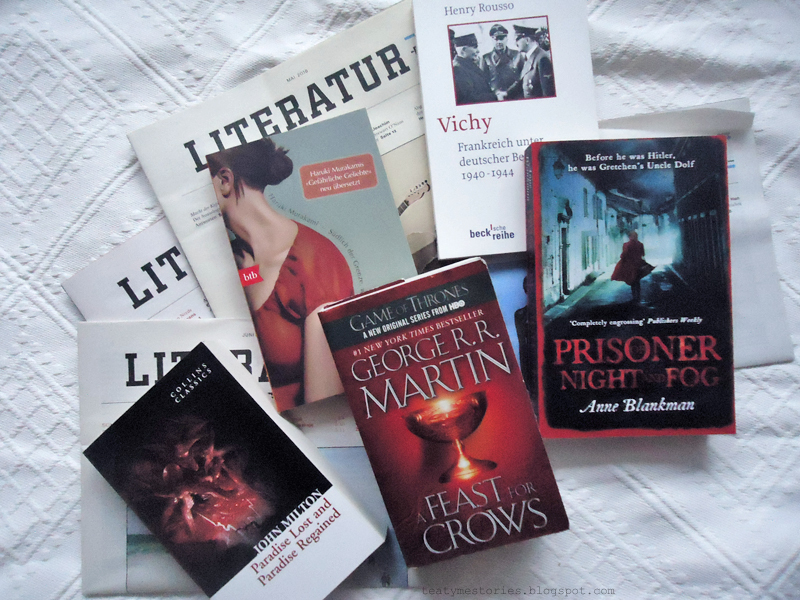 And of course if I managed to read all of the books I wanted to read. I've written about books before in random posts but I think it's neater to have a special category for them. And maybe that way I will make myself read more books. This month there are actually quite a few books on the list. But that's also because I have to read some of them just for uni and not for pleasure (though some are still interesting). One of them is a non-fiction book about WWII in France (Vichy) for a history course. The other one is Milton's Paradise Lost. I'm not sure if I'm really going to read the whole book; it's very tiring because it's basically a poem that's like 300 pages long, thus it's pretty hard to keep track of the story. I also have to read like 50+ pages weekly on various other topics and for various courses and I kinda have difficulties keeping up with everything haha. A Feast For Crows will probably be featured in this series every month because it literally takes me years to finish books of the A Song of Ice and Fire series. It was my goal to finish it by the end of the year but my new goal is to finish it before GRRM releases The Winds of Winter. So there's still plenty of time left and I don't have to put any pressure on me haha. (Please hurry up, though, GRRM!!!!) I'm currently on page 306, which is the beginning of a chapter of Samwell. Well, all I can say is that some characters' chapters are easier and more fun to read than others. Another book which I'm currently reading is South of the Border, West of the Sun by Haruki Murakami. So far I've only read realistic books of Murakami even though I've heard that his fantastic ones are supposed to be even better. I'm planning on writing a proper review about this one so I don't want to go into detail now. 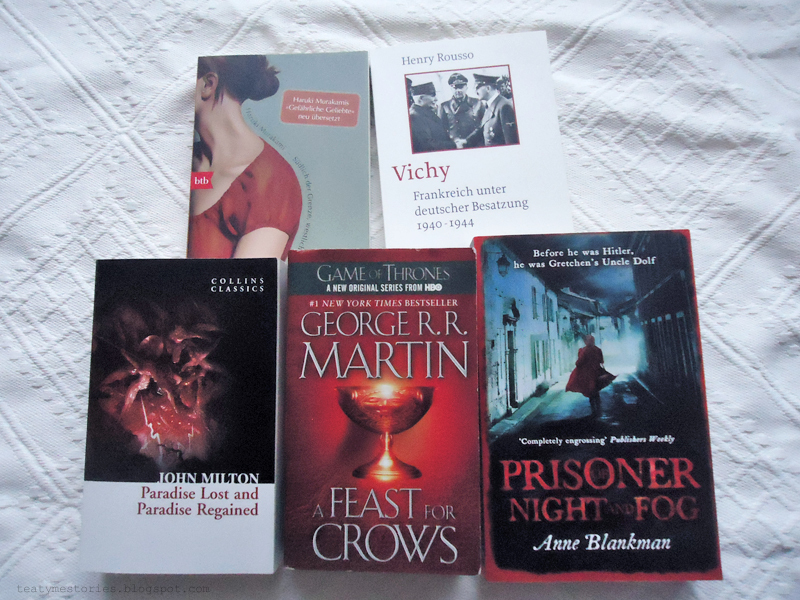 Last but not least I want to read Prisoner of Night and Fog by Anne Blankman. I've come across this on Instagram and I was kinda shocked when I heard the story. It's a YA novel about a girl in Germany in the 1930s whose family is very close to Hitler and she even calls him "Uncle Dolf". I don't know the exact plot but it is said to be some kind of murder mystery. And she also becomes friends with a Jew. So far, I've only read positive reviews about it and nothing controversial at all. That's the reason I want to read it, because to me it actually sounds quite controversial and like it's romanticising the whole setting. Can't wait to write a proper review about this. What are you currently reading or what do you want to read next?